I was at sixth form studying my A-levels in Biology, Chemistry and Mathematics. I then took a gap year to travel and research what I really wanted to pursue at university. During this time, I volunteered for the International Citizens Service and visited one of the poorest countries in Africa, Burkina Faso. I researched a bit about the universities offering the course I wanted to study, as it is quite specific and few institutions in the UK provide it. What attracted me to City is that it is ranked highly for medical technology. After looking into how the modules are taught, and that half of my time is spent at an impressive range of clinical placement sites, it seemed like the perfect choice. The thriving environment in central London. There is always something to do around the corner and I never get bored. My lecturers have made me excited about learning new things on the course and every module is captivating in its own way. I commute to the university and its location has made travelling by train a lot less stressful than I imagined. 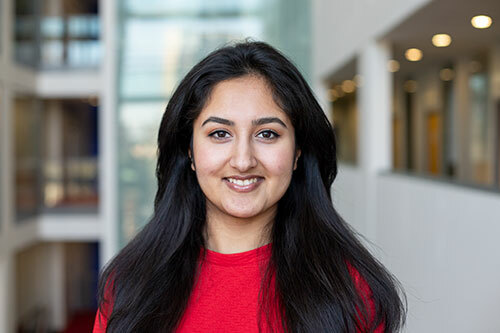 I am a Marketing Student Ambassador which is a great way to represent the University at events, such as higher education fairs and open days. I get to talk to students from all walks of life about the prospect of studying at university and hopefully dispel any worries that might be holding them back. I aim to pursue a career in the NHS. I would also like to specialise in an area of choice within my field. Go for any opportunities that come your way, especially if they seem daunting at first. It is the best way to make new friends you have never met in the first place and memories that you will hold for life.